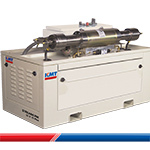 The KMT STREAMLINE® SL-VI 60,000 PSI/4,137 bar pump is available in a compact 15 horsepower model, uses minimal water consumption and is ideal for food cutting applications. • U.S. Food and Drug Administration approved process. • Eliminates the potential of salmonella bacteria by using only pure water to cut with. • No need to clean or sharpen the cutting tool. • Ideal sanitary and efficient process for cutting food. • No heat or chemicals are used. Only pure water. • Waterjet allows for higher yield of produce. • Airborne contaminants and fumes are eliminated. Minimal waste creates a better quality product. • Cutting nozzles can be stationary allowing food products fed through conveyor. • Safe for the Environment; no airborne dust and cleaner for food products. • Omni-directional cutting + Minimal tolerances = Perfect Portion Control. • Waterjet is not compression cutting method, which means longer and improved shelf life. For maximum performance and multi-head cutting on conveyor systems. For cutting flexibility in multiple food cutting applications. Ideally suited for lower demand cutting applications.